Figs in all shapes colors and sizes will be ripening in trees all over the South this June and July. I can remember crawling under the canopy of my grandmother’s enormous fig tree and pretending I was hidden away from the world. I also remember her firing off a whole pack of Black Cat firecrackers to shoo the birds away so they could not eat her figs before they were ripe enough to pick. Thankfully I was inside watching the show from the window, fig preserves and biscuit in hand, of course. While she has yet to employ the firecracker method against the birds, my mother has managed to grown an impressive Brown Turkey-type fig tree of her own. I always look forward to fresh figs in the summer and her jarred figs with lemon to tide me move till the next season. I hope you get your hands on some of these plump delicious fruits this summer and find new ways to cook them in your own kitchen. Cut the onion into thin strips and cook it in the butter until dark brown and slightly sweet. Remove from heat and set aside. Toast the flatbreads on a griddle or grill over medium heat for 8 minutes. You can also do this on an oven rack at 375 degrees Fahrenheit. Spread half the preserves over each flatbread, then sprinkle with onions. Top with strips of prosciutto and arugula. Finally, sprinkle with goat cheese crumbles. 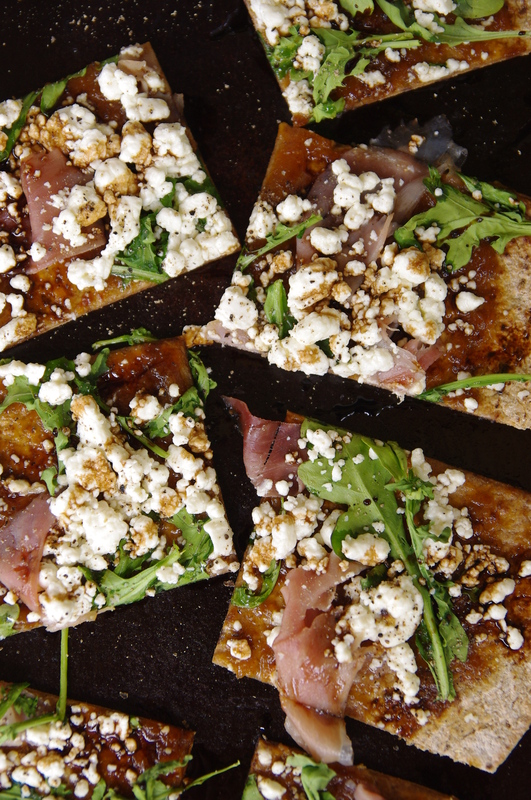 Place the flatbreads back on the heat for another 8 to 10 minutes to melt the cheese and slightly wilt the arugula. Slice and serve. Preheat oven to 325 degrees Fahrenheit. 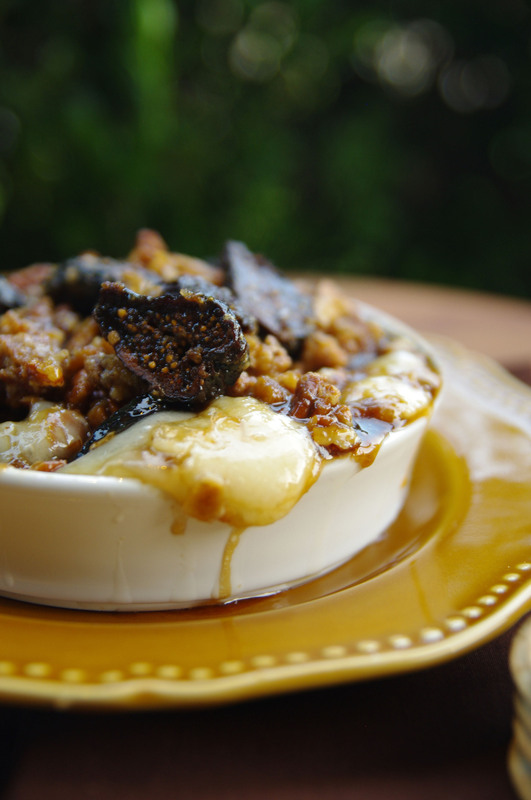 Melt butter and brown sugar in a small skillet or saucepan over medium heat at a simmer, add bourbon, figs and pecans. Turn the heat down to medium-low. Stir in the vanilla. Skim the white rind off the Brie with a cheese plane. Place the brie in a small round baking dish. Pour the fig and bourbon mixture on top, mounding it if needed. Bake for 10 to 15 minutes, or until softened but not melted. Serve with water crackers. Preheat oven to 350 degrees Fahrenheit. In a mixer on low speed, mix together sour cream, mascarpone, sugar, lemon zest and lemon juice in a mixer with a paddle attachment. Chill covered while you make the crusts. Grind the cookies finely with a food processor then pulse in the melted butter and salt. The consistency should resemble damp sand, if not add one more tablespoon of melted butter. Grease individual tartlets or one large tart pan. Press the crumb crust into the pan. Bake for 8 minutes. Cool the tarts in the pan for about 10 to 15 minutes. Then carefully remove from the pan onto dessert plates. 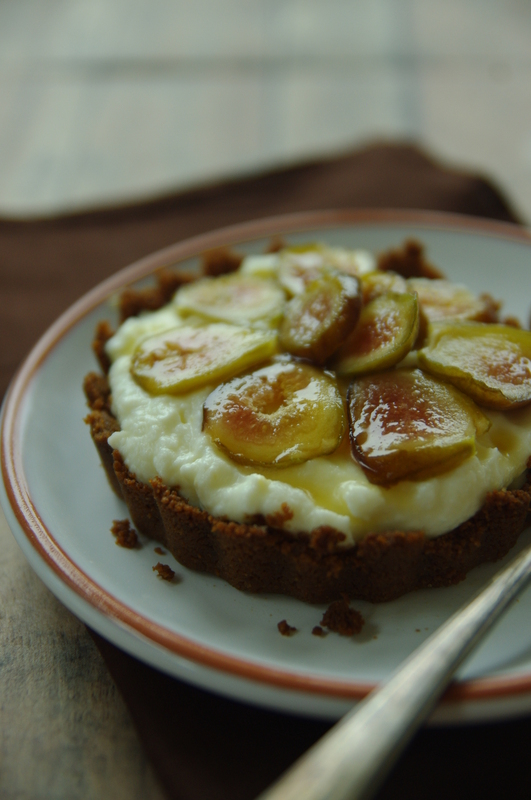 Fill with mascarpone mixture and top with slices of figs. Drizzle with honey and serve or chill to serve later.